Having read a series of stories by my friend, Israeli writer and public intellectual Yuval Ben-Ami, where he set off to see what it is like to re-examine his country′s main tourist attractions with a critical native eye, I decided to virtually follow his path. In my blog posts I share my memories on what it was like visiting those places as an expat in Israel. This is how Yuval describes his idea, and here I describe mine (which is also Part 1 of my journey – the Western Wall). Yuval’s second blog post was about the Baha’i Gardens, which he calls a journey to “extraordinary study in “otherness” within the Israeli and Palestinian framework,” so let us follow him – back in time. 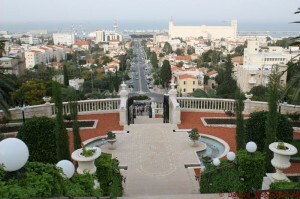 I visited the Baha′i Gardens in early November 2009, when I attended a Couchsurfing meeting in Haifa. I traveled to Akko and Ein Hod with Couchsurfers from North Israel and met many people who later became my friends. But the visit to the Baha’i Gardens was my own, individual venture. There is a history to that. My first encounter with the Baha′i religion was in the 12th grade, when my school hired a native English speaker to help us prepare for the English exam. After his contract ended, he offered to start an English conversation club, which I enthusiastically attended. In those weekly gatherings he introduced us to his religion, and we eventually met some local and expat Baha′is. Baha′is insist on calling their religion ′Baha′i Faith,′ because they reject the traditionalist, formalistic and often oppressive patterns in many other organized religions. Nonetheless, having known many Baha′is and done some research on them, I haven’t yet understood in what way they are different. They, too, are required to say a certain prayer multiple times a day, they have pilgrimage rituals and worship gatherings, but they dislike the word ′ritual.′ Also, in their vocabulary one does not convert to the Baha′i religion, one ′declares′ – a person, having already gotten close to the Baha′i community, makes a statement to a Baha′i that they would like to become Baha′i. S/he is congratulated by whoever receives the declaration, and that′s it. I witnessed one conversion in Budapest. Baha′i children don′t automatically become Baha′is – they need to officially decide at the age of 14 or later and ′declare′ like the converts. In 12th grade I really admired the Baha′i religion. It offered the sort of freshness that many older organized religions lacked. Not to deny its complexity and individuality, the religion is basically a blend of moderate Islam and 19th century Enlightenment ideals. It has made gender and racial equality, as well as inter-religious dialog, into religious principles. Due to their globalist ambitions the Baha′is are persecuted in some countries, notably Iran, where the religion originated. When I had a task to observe some community for an Anthropological methods class, my Baha′i friend E. suggested choosing her community and working on a participant observation project with her. It was a very enriching research, through which I learned a lot about religion, Budapest and myself. I kept in touch with the community and was invited to one of its countryside gatherings. There I experienced a strongly pronounced expectation, if not pressure, that ′time has come′ for me to ′declare.′ As much as I liked them, I never considered joining this community, so my enthusiasm cooled off somewhat. When in Israel, I got in touch with E., who had shared some memories of her Baha’i pilgrimage to Haifa. Many young Baha′is spend there a year or so volunteering, others are keen on visiting their holy place. She said she could introduce me to her friend, an American, living and working in the community center at the time. I am not sure if I can publicly share the marvelous story of this person, so for now I′ll keep it to myself, but I don’t mean to add to the mystery that flows from Yuval’s post. Due to a bit of bad luck, his only encounters with the Baha′is radiate an air of mystery. A guard tells him he is not allowed to write an article. “The Baha′is do not accept Israeli converts,” said a guide to our mutual friend Osnat earlier, when asked about conversion. The story I heard from the Baha′is I know is a bit different. They say that any Israeli convert would have to leave the country – such is the agreement. The openness of all the Baha′i communities I′ve ever met stood in sharp contrast to the mystery and self-protective behavior that nearly every Israeli talked about when we discussed the Baha′is. Before Israel, I would think that this is the most welcoming and proselytic religious community. In Vilnius, Kaunas and Budapest people would invite their friends to their devotional meetings, explain their religion and even ask guests to read a prayer. They would encourage conversion, and to former/hesitant Christians they would say that their love for Jesus would only grow. In Haifa, as a friend of Baha′is, I could go to non-touristic venues where volunteers go. In Budapest, I met converts who previously were Catholic, Protestant, Jewish or even Atheist. Baha′is are also known for embracing intermarriage. Their mixing of nationalities seems almost deliberate, but in fact it happens when they travel the world and volunteer. The Baha′is don’t mind the presence of other religions in the family either. As I understood, they simply think that other religions are like B&W/ Sepia photography, when theirs is color photography. The former is still beautiful, but not exactly adequate to the modern world. To my surprise, my Israeli friends had an impression that Baha′is keep to themselves, only marry their own, and refrain from any communication with Israelis. Which, I guess, is true in Israel and only shows how much tension there is and how cautious the community has become. After all, the dynamic flow of volunteers depends on accessible visas and freedom of religious practice. The temple is quite unusual, out of the context, especially after having returned from Akko, but it feels peaceful and there is a good vibe in the air. You can almost feel worry wrinkles straightening on your face. The temple itself was under reconstruction, so I pointed my camera down the slope. I thought it was a bit unfortunate that so much water, so precious in Israel, is flowing in multiple fountains, but I’m sure that the Baha′is have ways to make it sustainable and reuse the water. Perhaps it’s even from the sea. Perhaps Yuval is right about extraordinary otherness. The contrast between Judaism and Baha′i religion is breathtaking. Baha′i converts casually ′declare,′ get a group hug, there is no need to suffer and be rejected. Baha′is shun ritualism, whereas for many of Israel’s secular Jews ritual is all they know about religion. The Baha′i religion does have some fasting periods, but it doesn′t prescribe how to eat one’s food, how to sit during prayer, and whom to marry. In fact, going out to the world and engaging with other ′tribes′ is almost imperative for most Baha′is outside of Israel and those countries where religious practice is restricted. The Baha′is often talk about striving for world peace. Many work for the UN and other international bodies, many turn to academia and other influential areas. They believe that the moment will come, and all forces must be united to pave the path for it. The Baha′i religion is represented in the most remote corners of the Earth due to their volunteering in the areas of literacy, health, peace-building and others. Yet the history of their temple in Israel, as well as the tense situation, appears to keep them from behaving as they would elsewhere in the world. This entry was posted in Travel blog and tagged baha'i, baha'i gardens, beaten path, community, couchsurfing, haifa, israel, Yuval Ben-Ami, proselytism, religion, tourism, travel on 2014-12-18 by Daiva.